After the rather changeable weather of the previous week, Pershore enjoyed a day of warmth and good music as Pershore Midsummer Brass came to town on 1st July. Once again, the town was bathed in the sound of thirty brass bands entertaining those who came to listen to a variety of different genres of music, from film scores to Faure ad even new productions played for the first time. The event began as ever with an amazing fanfare specially written for the event played from the top of the Abbey Tower, which could be heard from across the town. Players from Bretforton Silver band then hurried back down to play the first concert in the Abbey where the band and audience were treated to a warm welcome from Bob Gillmor the town mayor. According to one visitor, this really made the event that extra bit special, and it is something the town mayor has been able to support most years. This year six new bands joined the line-up. Filton Concert Brass from near Bristol, Jackfield Band from Telford, Gloucestershire Police Band, Langley Community Band and the West Midlands Salvation Army Youth Band and Ledbury Community Band all played brilliantly. Kate Seabright, Secretary for Ledbury Community Brass Band, thanked the committee for “a really wonderful day.” She said, “It’s always so inspiring to hear all the different bands, and get to talk to so many different people all with such a passion. 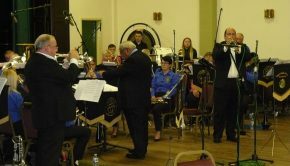 There were also many training and youth bands at Pershore, giving new players the opportunity to take part, including Bret Set Go, Nunnery Wood High School brass Band, the West Mercia Police Youth Band, West Midlands Brass Academy and the West Midlands Salvation Army Youth Band. Nicky Daw, conducting Worcester City Youth and Training Bands agreed that Pershore Midsummer Brass was “A wonderful day enjoyed by our young players and an excellent way to introduce them to the world of Brass Bands in such fantastic venues in Pershore!” Like all of us, Nicky and her band are looking forward to next year’s event and being part of something really special and rewarding, a feeling reiterated by Kate Seabright for Ledbury Community Brass Band and many of the other conductors on the day as they introduced their bands. Bands of every level, whether competing, non-competing or even training bands, tend to share a few of their players. In fact, many of those playing instruments at Pershore Midsummer Brass play for more than one band. The unique concept of Pershore as a non-competitive festival gives these band members the opportunity to deputise with different bands, sometimes bands they have not even practiced with or met before. Those playing for as many as three bands included Ken Smith, Alex Dentith, Mary Anne Cox, Lord Saltwood, Jay Willis, and Becky Kerridge. Meanwhile Oliver Wilson played with two and conducted one band, and Craig Williams played for four bands. But Tim Gutteridge was barely off the stage all day. Playing drums and trombone for so many bands we lost count. 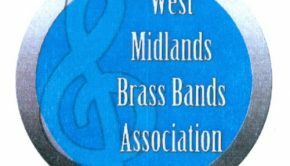 Visitors travel from near and far to support Pershore Midsummer Brass, and John West Confirms that “although most people come from nearer to Pershore, some came from as far afield as Edinburgh, Norfolk, North Yorkshire and Kent to enjoy the day”. 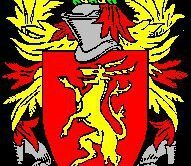 The Committee Chairman, John West looked to the future, telling A4B: “The committee is a very small one – if anyone would like to join us to help with next year’s event we would be very pleased to welcome you. 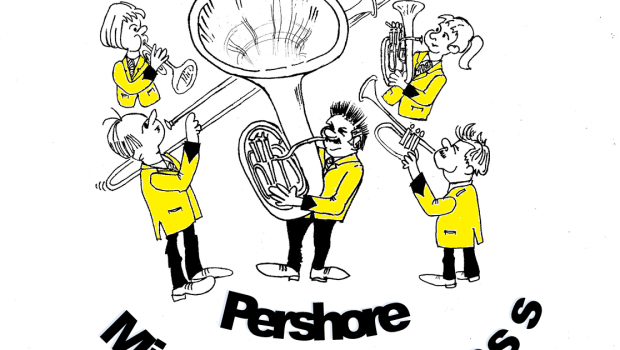 We start the plans in September.” The committee can be contacted via our website: http://www.pershoremidsummerbrass.org.uk. John went on to thank the volunteers who helped with the event saying: “We are indebted to these good folk, many who come year after year, to support us and make the day run smoothly and they cheerfully welcome the bands and the public. We even get those who apologise because they have miscalculated and booked holidays and so can’t help this year but ask to be kept on the list of volunteers for the next year”. Next year’s event will be on Saturday 7th July 2018. Bands are already lining up to be included so keep an eye on our website and social media for more information. But brass band fans will not have to wait till next July for some great music in Pershore, because there will be a special fundraising concert on the afternoon of Saturday October 21st October featuring Shipston Town Band.